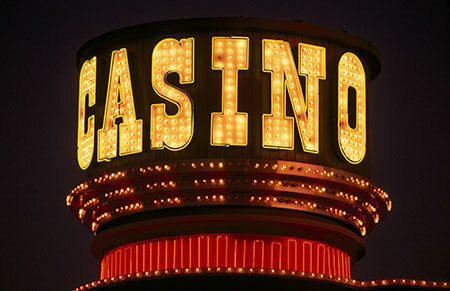 Throughout the world, the word 'casino' is instantly recognizable. In Italy, where the term originated, it is casinó. In Germany, Sweden, and Finland, it is kasino. In Poland, it is kasyno. In Portugal, it is casino. In Romania, it is cazinou. Everywhere, it is known as the place where people gather to wager on games. From its Italian and Latin roots, 'casino' literally means 'little house', from the root 'casa-' (house) and the suffix '-ino' (diminutive, small). The first government recognised gambling house was Il Ridotto in Venice in 1638. 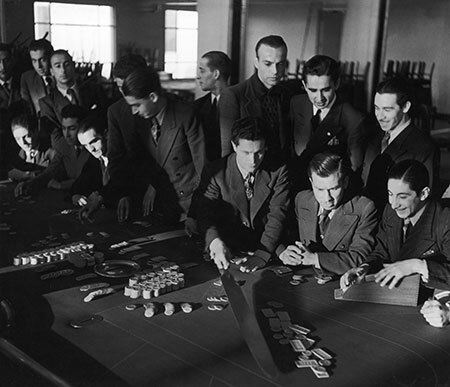 The first use of the Italian term 'casino', however, did not occur until 1744. 'Casino' became known in Italy as a name for a villa or summerhouse. It then became the name of a gathering place for pleasurable activities, including gambling. By 1820, an English book about Italy recognised that 'casino' had several meanings, including, 'a set of farm offices, a county-seat, a gambling house, and a game of cards'. Whether you are entering a gigantic casino resort in Las Vegas or Macau or playing PokerStars Casino in your own home, the casino has a unique language developed over centuries. In fact, that language has spread to everyday life. The expressions we use for winning, losing, luck, and even sanity and death reflect the importance of the casino games we play. Cards as Life – You can find the road to success if you play your cards right. When it is time to be honest, you lay your cards on the table. Overwhelmed? You must have gotten lost in the shuffle. It was not your fault; the cards were stacked against you. Unpredictable people are wild cards. Crazy people are playing without a full deck. Wagering as Life – A conservative person hedges their bets. A careful person plays close to the vest. To attract interest, you may have to sweeten the pot. Luck as Life – Is life going well? You are on a roll. In the most positive situations, you hit the jackpot. Maybe you even break the bank. Only rarely do people claim luck is on their side. More often, life situations are a crapshoot; it is all in the luck of the draw and all you can do is let the chips fall where they may. A refusal or failure? No dice. Casino language comforts us in the worst situations, like when the chips are down, all bets are off, and it is necessary to bet your bottom dollar and go for broke. Life from Dead Games – Many popular expressions come from long forgotten games. Faro was the most popular casino game in the United States in the late nineteenth century. You could enter a saloon and find Wyatt Earp or Doc Holliday dealing faro. (Betting against rough, questionable characters may have helped kill the game.) Numerous faro expressions have outlived the game by at least a century: playing both ends against the middle, breaking even, shoestring (having little money), in hock (debt), string along, case the joint, take a tiger by the tail, punters (players), keeping tabs, and stool pigeon. Other durable expressions originated from games few casino players would recognise: left in the lurch (from the French board game Lourche or Lurch), rigmarole (from the medieval game Rigmarole), riffraff (also from the game Rigmarole and similar games), hazard (from the game Hazard). Roulette: Roulette developed in France, getting its name from the French expression 'little wheel'. Famed scientist and mathematician Blaise Pascal may have been involved in developing roulette. His quest for a perpetual motion machine led to the game's nearly frictionless spinning wheel. Old English games with similar elements to roulette have included Roly Poly, Ace of Hearts, and Even-Odd. Old Italian games with similar elements, some even noted in the memoirs of Casanova, include Biribi and Hoca. American vs. European Roulette: Despite the American obsession with setting the standard in all endeavours, they have clearly failed in roulette. 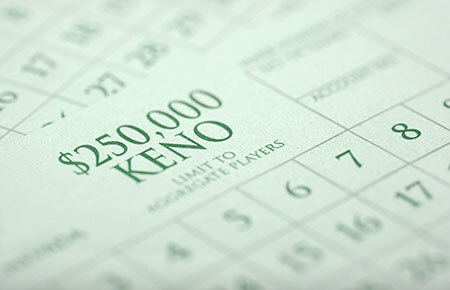 The American version, adding 00 to the European layout of numbers 0-36 while offering identical payouts to the European version, gives the casino an insurmountable edge recognised by most patrons. The European game has even developed additional inducements for players, like the en prison and le partage bets, which further protect certain bets from the dreaded zeros. 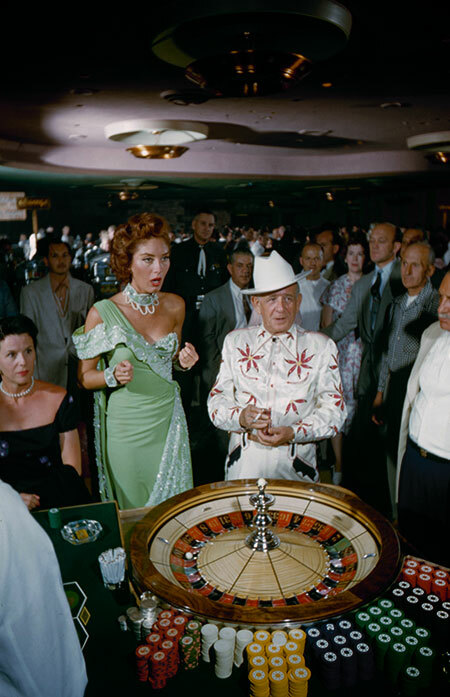 American casinos developed the custom of giving each player chips of a separate colour, an unnecessary convenience for an unpopular game. Even here, the French have given the name 'the ficheur' to the mechanical device used to sort the different coloured chips. Russian Roulette: Not a game, or roulette, or Russian. The expression refers literally to putting a bullet in a revolver, spinning the chamber (like a roulette wheel), and pulling the trigger. A few nineteenth century Russian novels described the stunt, and a myth developed after World War I about reckless (or ruthless) Russian military officers who supposedly tried it. For the few reliably recorded incidents of people playing Russian Roulette, it has gained enormous fame in novels, movies, and other depictions of war. Mostly, the expression thrives in popular culture as a metaphor for the cruelty of fate. The game now called blackjack or 21 has been played under different rules and names for more than 600 years. There are written references to a Spanish game trente-un (31) as far back as 1440. The dominant game among these variations became vingt-et-un (21), which flourished in France at the beginning of the 19th century in part because of the interest by Napoleon Bonaparte. 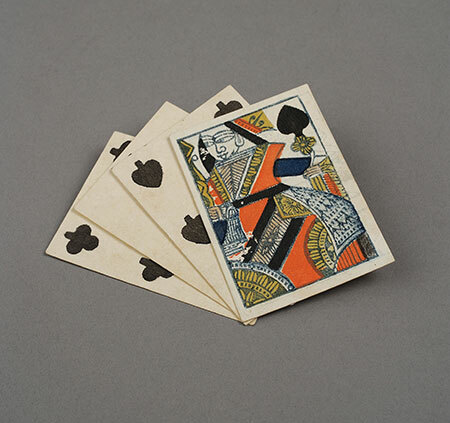 In the early 20th century, some American establishments tried to boost the popularity of 21 by paying players a tenfold bonus for a natural 21 with the jack of spades. The practice has been abandoned but the name stuck. Craps: The modern casino dice game is called craps. In most countries, it is known by this name. In many languages, the name of the game is the same as the translation for the word dice or the phrase dice game: dado (Spanish), Würfelspiel (German), kosci (Polish), zaruri (Romanian). 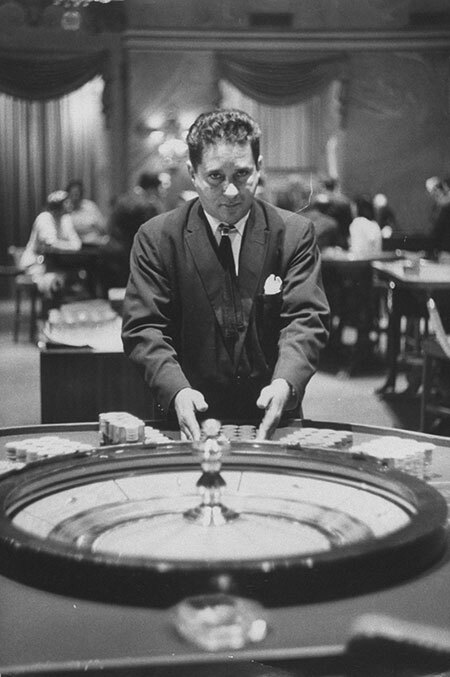 Like many casino games, its origins and etymology is vague and disputed. A dice game from the Arab Peninsula, azzahr, became popular as hazard in England. The lowest dice roll was called crabs. Other histories suggest the name came from the French crapaud (toad) because it was played on streets and sidewalks, with players squatting to reach the dice. Dice: Rolling the bones is a casino rite of passage. The oldest gaming pieces found by archaeologists are dice, made from a sheep's astragalus (the bone above the talus or heel bone, also called the hucklebone). The earliest six-sided dice unearthed in Mesopotamia (northern Iraq) date from 3000 B.C. Dice are marked with pips instead of numerals because the standardization of symbols on dice (1300 B.C.) predates the Hindu-Arabic system of numbers (which started in 700 B.C.). 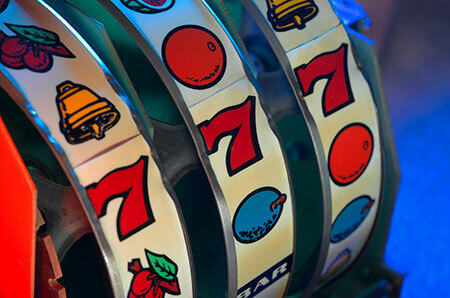 The traditional slot machine dates from the 1870s to the 1890s. 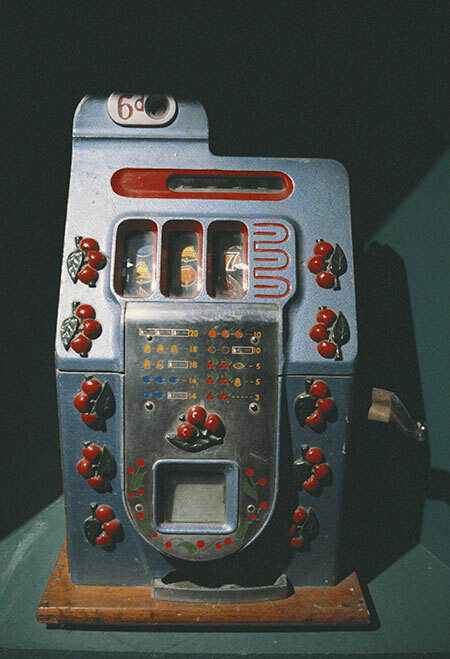 The coin machines quickly became known as slot machines, for the slot for inserting coins. 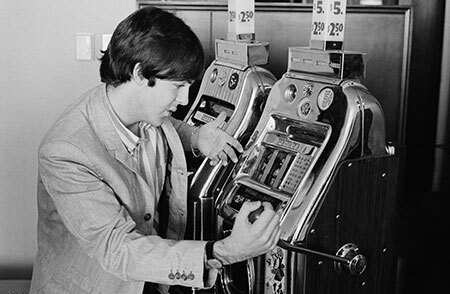 In England, they are called fruit machines because of the popularity of images of fruit on the spinning reels. The earliest machines featured mechanical reels but required a proprietor to pay the player. The first popular 'modern' slot machine was Charles Fey's Liberty Bell machine in the 1890s. Liberty Bell's reels stopped in sequence, collected player coins in a hopper, and paid them out automatically in a bucket. The clatter of coins or tokens on metal, especially when a payout cascaded into the bucket, became the signature sound of casinos where the machines became popular. Of course, the handle initiating the game sequence has given the machines the universal nickname as one-armed bandits. 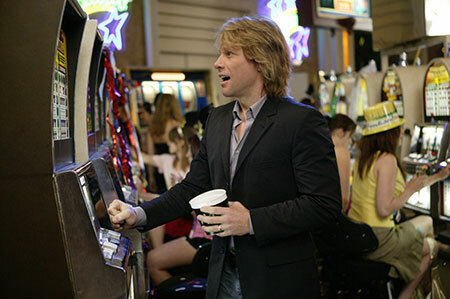 The popularity of slot machine has survived changes in almost all the original elements. Digital readouts and computers have replaced mechanical reels. Buttons have supplemented or replaced levers. Even the sound of the coins has been largely silenced: players quietly insert currency. They are paid with tickets redeemable at the cashier's cage or on-site ATMs. The distinctive sight of slot jockeys with their slot gloves and gigantic plastic coin buckets has also nearly disappeared. Baccarat: The name is derived from the Italian game of baccarà, and most versions of the game have been loyal to the original name. Punto banco refers to the player and banker, the two constituents in baccarat, though the word 'banco' is also spoken by a player who bets all of his or her money. It is one of the few card and casino games of which the name survived many centuries of play. The word baccarat actually refers to the worst hand in the game, which is one that totals zero. French terms come into play, as La Grande is a natural nine dealt on the first two cards, and La Petite is a natural eight. The banker is the dealer in the hand (called the croupier in France), the one who controls the game and cards, and the bank (sometimes called the shooter) is dealt last and acts last. A callman sometimes runs or calls the game. A palette is the wooden tool used to move the cards, and the shoe houses the cards. When the player and banker tie, the hand is sometimes called a standoff. Every casino game has some connection with numbers. Therefore, casino players have superstitions covering most numbers. Six: Number 6 is considered unlucky based on the 'number of the beast' (666) in Revelation 13:18. In Asian culture, however, the number translates into 'everything goes smoothly'. Anyone playing Roulette regularly flouts this superstition: the sum of the numbers on the layout total 666. Seven: The legend of 'lucky 7' comes from many cultures. Ancient Greeks thought 7 was lucky. Pythagoras considered 7 to be the perfect number. Seven was also the number of Roman gods, Egyptian gods, wonders of the ancient world, ancient Buddhas, and Japanese gods of good fortune. The Old Testament recognised the 7th day as god's day of rest. Israelites toppled the walls of Jericho by marching around them 7 times. The New Testament features 7 seals in Revelation, 7 heavenly virtues, and 7 sacraments. These ideas are contrary to Chinese, Vietnamese, and Thai traditions in which 7 is unlucky. Eight: the luckiest number according to Chinese tradition. A series of 8s is even better, due to the sound of the Mandarin Chinese word for 8s sounding like the word for prosperity. In Cantonese, 8 sounds like the word for fortune. Eight is unlucky in India because of its relation to words for 'breaking'. Thirteen: Fear of the number 13 actually has a name, triskaidekaphobia. This superstition developed from the Biblical legend that Judas was the 13th guest at the Last Supper, the first to leave, and he died by his own hand. In fact, many other numbers are lucky or unlucky depending on your nationality and culture. Three is lucky in Sweden and Italy, unlucky in Vietnam and Japan. Four is lucky in Germany, unlucky in China, Taiwan, Singapore, Malaysia, Japan, Korea, and Vietnam. Nine is lucky in Norway, unlucky in Japan. Seventeen is lucky in Italy. A congregant at the church near the Monte Carlo casino left the Sunday service and, on a hunch, bet number 36 at roulette. He had just finished singing hymn 36. He won, told his friends, and they all came to church the following Sunday. After the service closed with hymn 27, an exceptional number of the faithful walked to the casino and bet number 27. Even though the number did not win. The hopeful crowded the church the next week. The clergyman suspected he had become a peddler for the roulette wheel, so he called for hymns with numbers above 36, the highest number on the roulette layout. Church attendance soon dwindled to its original size. Adolphe Smith's Monaco and Monte Carlo (1912) described several superstitions he witnessed at Casino de Monte Carlo. One woman snuck a five-franc coin into a ceremony with the Pope and had the coin blessed. She took the blessed coin to the casino, and won at roulette. Her companion, however, lost at roulette and complained so bitterly the woman allowed her friend to hold the lucky coin. Somehow, the friend immediately bet and lost the coin. Smith described an elderly woman who showed him a bat heart she kept in her purse, touching her coins to the talisman before playing them at roulette. Some casino players consider it bad luck to use the casino's main entrance before playing. 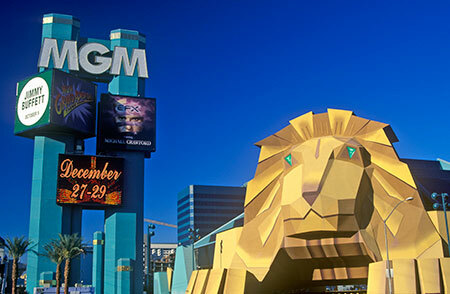 When MGM Grand opened in Las Vegas, Nevada, USA in 1993, it compounded the fear of bad luck by designing its main entrance as a gigantic golden lion's head. (MGM's logo was a roaring lion.) Whether it was the general image of players throwing themselves into a lion's jaws or an Asian superstition regarding cats as unlucky – or some other reason – the casino redesigned the entrance just five years later.